See the Administration Information page for details on all rental fees. 8.1 Residential Use, Leases. Each Dwelling Unit shall be used for single-family private residence purposes only. No more than one (1) Dwelling Unit at least twenty-four feet (24') wide, shall be located on any one (1) Lot. Nothing contained herein shall restrict an Owner's right to lease his Dwelling Unit for residential purposes, provided, however, that no Dwelling Unit may be leased for a term of less than thirty, (30) days, and, provided further, that such lease is made to natural persons (and not corporate or business entities) who agree to be bound by the terms and conditions hereof. This provision shall not restrict Declarant from entering into agreements with Owners to provide for the lease of a Dwelling Unit for marketing purposes, even though such use may be for terms of less than thirty (30) days at a time. 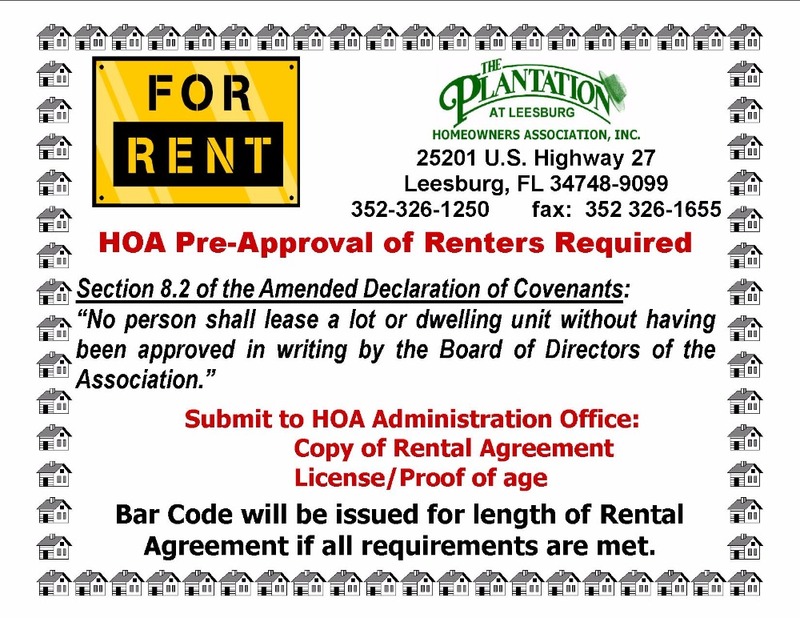 This page is for Plantation Homeowners to list their homes for Rent. Postings will removed after 2 months. All other postings will be deleted.